“Your tram will be at door number six” the lady said. I stood in front of “the door” wondering just where the opening was. I’m familiar with how theme parks masquerade entryways, but this one looked way too small. Besides, I wasn’t at a theme park. 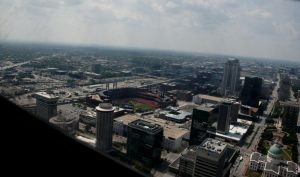 I was at the St. Louis arch preparing to ride to the top. I have driven by this famous monument 3 times previously and never stopped. This time I was going to the top! After a short movie played and the previous riders disembarked, I stood face to face with something that looked really surreal. 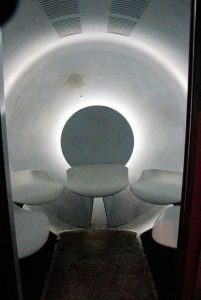 Here was a small, round capsule with five small seats, entirely painted in white. The walls were white, the seats were white, you get the picture…. The soft glow of florescent lights highlighted the bright white interior in such a way that looked like something you’d see in a movie that transported people to heaven. Hmmm….I was in the final few days of my road trip and had a few more things on the itinerary. Visiting the Pearly Gates was not one of them!! I tentatively stepped into my tram and was the only person in it. Looking around inside, I had visions of being claustrophobic at times and afraid of heights. Whatever happens, I’m going up; at the very worst, I’d just close my eyes. Soon the two glass doors closed and I was on my way . The lady said it takes a minute to get the top. I’m calculating the height divided by the speed, etc. Hmmm……there aren’t any seat belts or warning signs of motion sickness. Fortunately, the ascent is a slow controlled movement. Looking out the glass doors, I could see the emergency stairs right alongside which was comforting. As I ascended higher the stairs disappeared and the internal structure of the arch was visible. The grey steel supports formed their familiar X pattern and tons of large rivets dotted the inside of the walls. I just kept trying to not think of how high I was. The doors opened, I bounded up the stairs to the top and Wow!! I could see everything from here. On a clear day, you can see 30 miles. 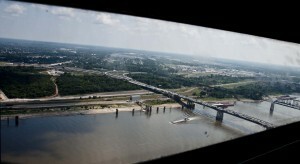 Looking out the East side, you can see the Mississippi River and the famous Eads Bridge. At the time of completion, in 1874, the Eads Bridge was the longest arch bridge in the world. On the West side, the city of St. Louis stretches before you and you can easily see such landmarks as Busch stadium were the St. Louis Cardinals play. If you lean up to the window and look straight down, you can see the lawn in front of the arch. This is a fun reminder of just how high you are; 630 feet. It sure looks a lot higher than that! Speaking of being high up, the St. Louis arch is the tallest man made structure in the U.S and the tallest arch in the world. Of course, I had to find out the significance of the arch. 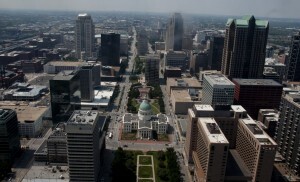 The arch symbolizes the westward expansion of the United States and is part the Jefferson National Expansion Memorial. In addition, the shape of the arch is actually a catenary curve which is the same shape a chain forms when held at both ends. Within walking distance, you have the tallest arch in the world and formerly the longest arch bridge in the world. I have to wonder if there are more historic arches that I didn’t see. After peeking out every window and snagging a few photos, it was time to head down. At the bottom, there is a museum that highlights the westward movement with more interesting facts. My favorite scene was a covered wagon in front of the photo of a space capsule. We’ve come a long way! The trip up was only $10 and around 2pm on a Friday afternoon, the wait was only about 10 minutes. When you’re in the area, definitely plan to stop in. 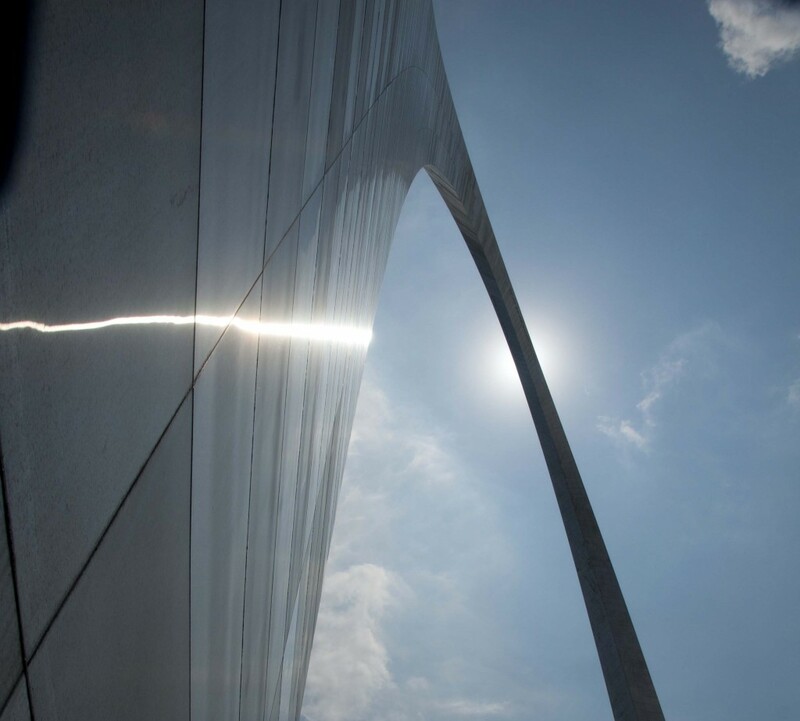 The arch is literally just off the main highway so it’s easy to access and enjoy an iconic piece of American history.